Not everyone can afford a bath size water garden kit, but what about using an old tub that was cast off from a remodeling project? What about old teacups turned into bird feeders? Or signs made out of old lumber, or the newest trend… making stuff out of wooden pallets? In the following sections: learn how to save money in the garden. Dividing your plants will make more, for free. Growing from seed and making your own pots. Making compost for healthy plants through scrap recycling. Measuring soil amendments correctly for no waste. Lift older plants, cut them apart and plant each piece as a new plant. Many perennials are multiplied this way. Divide Your Plants and Multiply! Just take a sharp tool of the appropriate size for the plant and slice into it. Take part of the plant and a good bit of root and you are the new owner of a number of new plants. Perennials usually have to be divided at some point, although there are a few that you only divide when you want more plants, but did you think about the possibility of having many plants of one you just purchased? I did this with moss phlox, Phlox subulata, which I had planted on a hillside in my yard. Hydrangea shrubs are easy to divide. People are afraid of dividing shrubs because they are woody, but many types of of shrubs are easy to multiply trough division. Simply divide off a small start from the side of a shrub such as a Weigela or a Spirea, and plant it just like any new little shrub. Plants that have multiple stems and fibrous roots are most likely able to be divided into many new plants, those with tap roots and single trunk are least likely to be successfully divided. Need help in figuring out “tap roots, stems, etc? Try some Plant Science for Laymen. Whether you are a new gardener or an expert master gardener, it is always cheaper to grow your own plants if you need a number of them. This book is one of best to have on your gardening bookshelf for learning all about making more plants successfully. Another way to garden cheaply is to know which books you really and which are less than you hoped. This is one of the few books which will be very useful over and over. One of the least expensive ways to fill your garden with flowers,vegetables, and plants is to grow them from seed. 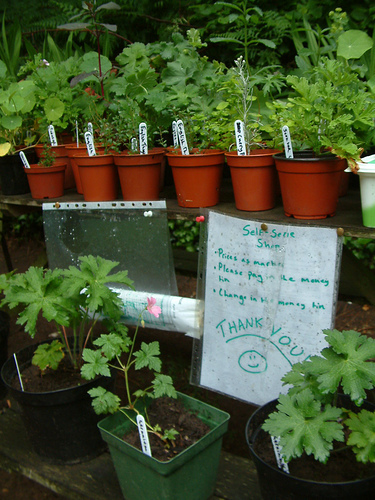 Growing from seed can be the single most economical way to have lots of plants in a short time. They often are inexpensive, and the materials used to start them can be homemade ( pots or growing trays from household castoffs). For many crops you don’t even need to start the seeds inside. They can be directly sown into the garden. Carrots, lettuce, spinach and other food items are grown this way. Besides dividing and growing from seeds, there are other means to propagate plants- even expensive ones like named rare evergreens. Get a resource book that will guide you to expertise. 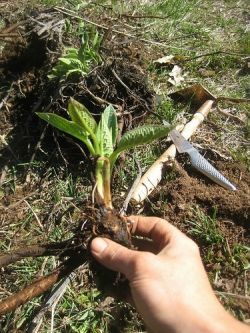 Learn to multiply plants through softwood and hardwood cuttings, leaf cuttings, etc. 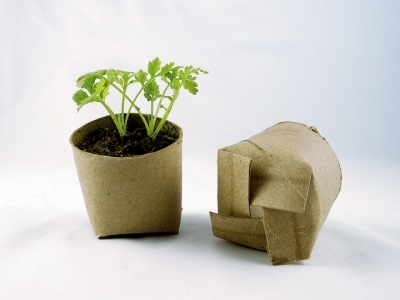 Using a simple tool can turn old newspapers into seed starting pots. Everyone wants to save a little cash, don’t they? well, more than that we are all getting much more aware of being environmentally responsible. It is time for frugal gardening tips! We have entered an economic new era, one in which frugality plays a major role. The garden is one place where we can have the luxury of a beautiful surrounding with lush plantings for a limited budget, if need be. Besides the beauty of a garden, it is one place where you can do something about that high food bill and actually have more gourmet quality food! It all depends on the effort you want to put into garnering the skills, creating the long term environment for a fertile growing place, and learning a few tricks of the trade. I suppose besides that, you might have that frugal gene that gets unexplainable glee at being as cheap as possible on what can be the extreme challenge of a trip to the plant store. Once you’ve caught the gardening bug, you may find it takes your wit and will to outsmart the wily, winsome plants displayed.It is a huge act of willpower to not bust the budget with impulse purchases. Thankfully, plants like to reproduce readily for the most part. That can make them inexpensive, when you learn how to propagate them and find the best deals for new ones. Of course there are some caveats along the way- that is what challenges your wits and makes it more fun. The cheapest way to save money is to get something free. Passalong plants are what some call them, friendship plants by others, but they are the plants that other gardeners wish to bless you with. While it is good to not kick a gift horse in the mouth, you still need to know how to avoid problems from this act of kindness. Some plants are invasive and you will hate yourself for planting them. They are sometimes something you bought unaware of its thuggery, but often they just grow SO well that others have lots to share with you. Understand the nature of the gift plant before you make it comfortable in your garden. Other than that, if you are given a nice healthy plant that is loved by others… it will be a great addition for your garden and you can start the next prime way to gain many inexpensive plants. Buying from yard, tag sales, and benefit sales, buying at the end of the season- these are all ways to save money on your plant purchases. Some plants act badly in the garden, they don’t make good neighbors. You can help them move in, but you may regret it in the future. This list is to help you decide whether you want to do that. Remember that dandelions were once someone’s favorite salad vegetable. If your free plants crowd out more valuable plantings, if they require lots of work to control, if they are detrimental to the environment (compete with native plants, poor nutrition for wildlife), then they are no longer a bargain. They turn into black gold for your soil. 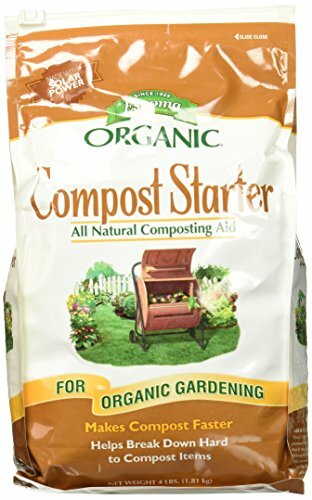 Compost is pure gold for a gardener. Make your own and add to the flower beds and veggie patch. Thought the first tip would be about which plants to buy? No plant is a bargain when the soil is so poor it doesn’t grow well or -horrors- quickly dies. Your soil can be improved and there are cheap ways to do that. Make your own compost pile. Your own bin or one that is purchased will collect all your green waste, vegetable peelings from the kitchen, coffee grounds, tea leaves, etc. And it should reduce your garbage that would need to be collected to some degree, too! I used to hear stories about gardeners who would not find it beneath them to follow the horse trail to gather good horse manure. If you have a source of manure from a horse, cow, or chickens, that is ideal to age for some months and then fertilize your soils. 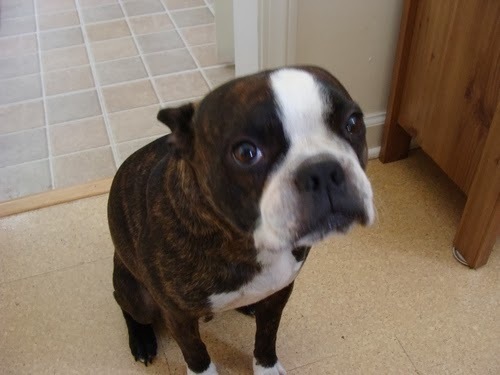 Forget about waste that comes from you, your cats, or your dogs, which aren’t healthy wastes to use. All those leaves you either have hauled away or burn? Save them! Compost them! Create leaf mould which is one of the best soil conditioners- and they are free! Convenience and charcoal liner make this one gallon compost container a simple, attractive way to recycle your kitchen scraps. To some, compost making is a high art form. I take the lazy way and just pile and leave it to decay, but it is still important to know what to use (or not) to make the compost a healthy addition to the soil and for your property. You do not want to attract pests, or spread plant disease, which is why some materials are not added. You wouldn’t believe all the things that can be recycled into the earth. If you make, or buy, a compost bin it won’t take long before you have rich brown crumbly humus to add to your own pots and garden beds. What are the Composting “No-No’s”? Bag up tree leaves to decompose over winter. It isn’t difficult or complicated to learn to garden organically- just change some of your methods and lifestyle to become greener and you might love learning to take care of your world. Products to jump-start the garden might seem like frills until you realize that when growing food, the earlier you harvest, the earlier you save on the groceries. Growing organically may not be as simple, there are things to learn and time needed to build up the soils. In the long run, it is more frugal. It is also healthier. Soil amendments are the number one way to create better soil. The video on how to measure them saves waste. How and when to get supplies takes a small bit of effort for better gardens. Making good compost for healthy vegetables. Near a quarry? See if you can get some rockdust. Might be cheap, might be free. Need to buy fertilizer or conditioners? The end of season (fall time) stores usually discount their lawn and garden supplies. Green manure is the use of plants that can be turned under to add nitrogen to the soil, almost as good as the brown stuff. One way to save money is to buy just the amount of something that you need. Use this formula in the video above to compute your garden math. Another way to save money – books from moneysaving experts. It is so popular to save money rather than make money that people write books about it. This book is for you to keep the gardening budget trim and have fun doing it. 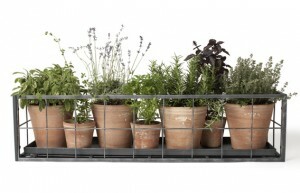 Ideas for choosing amendments, making more plants, making garden structures for less cost. More detail on many of the topics brought up in my article. One of the easiest ways to control costs is to stick with a garden plan. Like everything else garden plants and supplies have an off-season. This usually falls in July if you live in the USA. Many garden centers hold sales in July, but the problem with buying their bargains is that this is the hardest time to keep new plantings alive. The hot dry weather of continental USA is taxing for plants. Drought can mean death to new trees and shrubs even if they are planted in the spring. So weigh your choices, and if you can give your plants attention and enough water, by all means buy the bargains. Supplies suffer no such problems -so stock up on pots, tools, hoses, or whatever you find on sale. Autumn is an excellent time to buy sale plants for a cheap price, and as long as the ground is not frozen you can plant them. Cover them with some mulch and they should be an excellent investment. I guarantee nothing- but have had GREAT results from autumn planted bargains. Buy used tools either through auctions or at tag sales. There are some very good tools at garage sales! To save money sometimes you have to spend some of it. To save time, sometimes you have to put a little effort in at the beginning. To reap, you have to sow. Reusing material to make a cottage garden hideaway. Old shoes or old chairs? New pots and new potstands. Old fence boards? New raised bed frames. 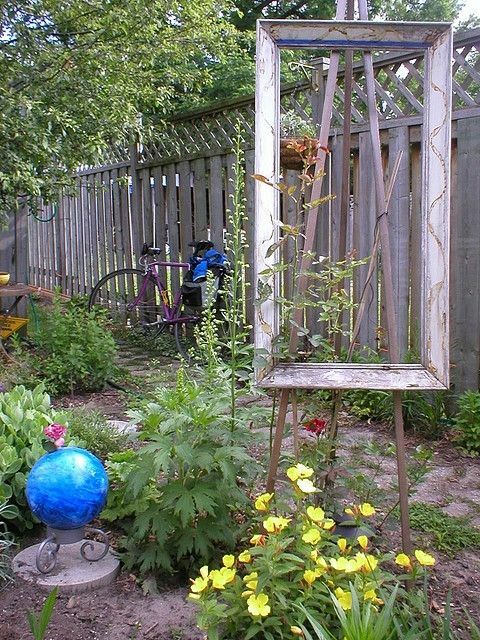 There are all sort of ways to make a new part of the garden from old sources of materials. The main thing you need is ingenuity, so put on your thinking cap. An old idea gives a fresh face to the patio. People are looking to flea markets, tag sales, and good old garage sales to re use and repurpose things for their garden. 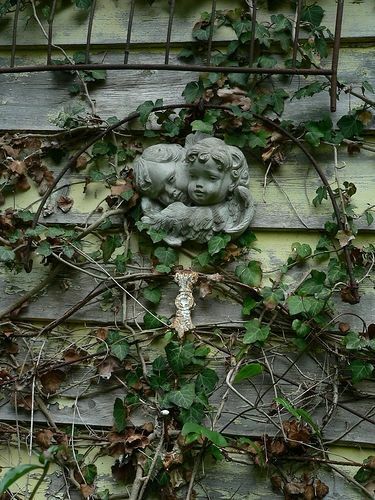 Some great finds are available, and it is a way to find statues and other types of garden ornaments, or cobbling together various architectural elements to create a little Victorian garden shed like this one, pictured above. Also in my car are plastic bags and bungi cords. Handi-wipes and sanitizers are must. Time to recall that famous old adage. Sometimes we wish we could be more frugal, more green, and ingeniously repurpose, but we need a little help. A book with great ideas and the how-to comes to the rescue! 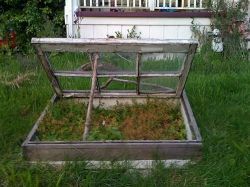 Old windows top a simple raised bed for an instant coldframe. 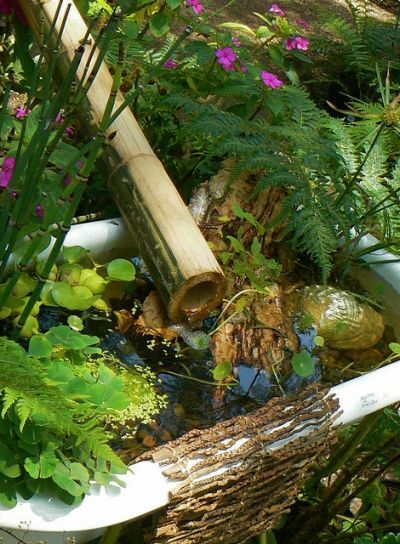 Bath Tub Pond is one example of turning trash into treasure, or re-purposing. Have Any Tips for Us? I would love to hear how you save money in your gardens. Or how your gardens save money for you. Some of you aren’t going to heed this advice. I blame the fact that this winter has been so long (psychologically) and cold that with all the complaints about it, many gardeners want to jump the gun. Whether the stores will aid and abet you, I don’t know… our road conditions have been bad and I haven’t gone to stores with seed supplies, yet. But be forewarned if you are having fun planting your little seeds under lights: they may get tall and spindly before you can safely plant them out. That sort of defeats the reason we start plants early. Ideally you would have sturdy, healthy plants that are ready to burst forth into growth once they hit the sun warmed soils. This winter may delay that time. Maybe not, and that is the throw of the dice for gardeners. My bets are agin’ it. It is sort of like the advice that seasoned gardeners give you about trees: a whip will soon catch up and even overtake the planting of a much larger transplant. So why waste the money and the expectations? Zone 5, here) might want to wait just a week more, or even til the end of the month to plant tomato and pepper seeds. Still, you might just get lucky with an early spring warm-up. Then you will grouse that I don’t know what I’m talking about. The thing is that for optimal growth it is the temperature of the soil rather than the air that matters to tender plants and their growth. So if I seem a bit over cautious, or wishy-washy about timing (depending on how you look at it), it is more due to the fact that we adjust our methods like an artists brush rather than an instrument’s calibration. Gardening is not precise, if for no other reason than we can’t predict the weather – and that has much to do with the art of gardening. So how about this advice? Get yourself a journal and start taking notes on what you do and what works or fails for you. That way you can become the reigning expert on what goes on in your garden, which finally is the only expertise that matters in this case. I will, however, be gathering together my seed starting supplies so that I can start some plants early this year. Even if I’m not quite ready to plant the seeds. The tomato is probably tops in what people want to grow for their dining table. It is just a guess, but due to the lack of good tomatoes available in groceries and the many ways we use them in our cuisine, that seems like a safe guess. 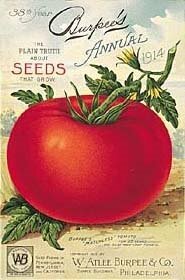 So garden articles, posts, and even books, are dedicated to the topic of how to grow a good tomato. Actually, I inserted the word “good” which how I think the tomato opus ought to be written. Tomatoes are easy to grow, it is the high quality of the fruit that can be a challenge. Nevertheless I will probably include some facts and links to sites that are better at a blow by blow set of directions on growing your transplants. My one hard earned piece of advice on your baby transplants: harden off. Harden off is the careful introduction of plants from the nice cozy environment of your home to the cold cruel world of your garden. OK, not cold, because you have to wait until after the frosts are totally over, but definitely cruel with real sunshine, actual wind, and soil. beat them with sticks and burn them; they love it. That is where the path of my post here will divulge from the main road of tomato growing advice. What is a good tomato, first of all? The one that tastes good, and the one that meets the need for the use at hand. It is that simple. There are so many varieties, colors, qualities, sizes, and flavors of this fruit that the answer isn’t any more simple or complicated than that…. until you try to compile a list of all the possibilities. I’d like to say which ones I like the most, and leave it to you to experiment with finding your own favorites. some people are going to insist that certain types of tomatoes are the best- but the next section of this post will debunk those ideas. ‘Amish Paste’ is one of the best. Paste tomatoes are good for cooking, sauces, and anywhere a meaty tomato is desired. This type of tomato has few locules, which are the seed pockets; most tomatoes have between five an seven of these, while the plum tomatoes have two. I found plum tomatoes to grow from seed very well. “Better Boy” is tangy and large, with not too much watery stuff inside. That is called the “gel” and I generally don’t like it. Tomato seed gel is reputed to control skin oiliness and to keep blood platelets from clumping. I ‘m happy to allow for such uses, but don’t give me seeping gel on my sandwich, please. “Early Girl” has smaller fruit that comes on earlier here in Ohio. I like the flavor and it is a plant that toughs out problems with growing conditions. This is a big deal for me after having lost a tomato crop to wilt a few years ago. It is one reason why I like the good old hybrid varieties. Look at a table chart of tomato disease and the resistant varieties of tomatoes. Bookmark for future reference. Beefsteak “Brandywine” types. I don’t love big beefsteak tomatoes, but I make exception for the Brandywine ones. “Caspian Pink” is the hands down favorite of these because the flavor of the pink tomatoes seems to be what I most like in an eating tomato for fresh use. The last few years I majored in “heirloom” varieties, and tried numerous types. 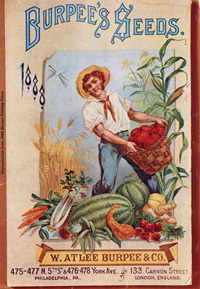 To be entirely fair those years were not the best conditions to grow tomatoes, but I had more problems with disease, and less production than what I was used to with hybrids like “Better Boy”. This year I want to give some of the black tomatoes like ‘Black Krim’ another chance, but I will likely only choose one or two plants i find at the nursery. A word on yellow tomatoes: people often love them. They are my mother’s favorite because of their low acid flavor. I don’t care for them, so they aren’t listed here, but “Lemon Boy” is one that my mom liked. You might want to look at the tomato growers list that shows you how many are available- they are a pretty contrast for salads, but I’d as soon have banana peppers for that. I can’t imagine the horror of a white tomato, so don’t ask me about them. I’ve also grown some cherry tomatoes, but they aren’t my favorites either. Too much skin for my liking. I’m just as happy chopping up a good tomato to size if I want something smaller. 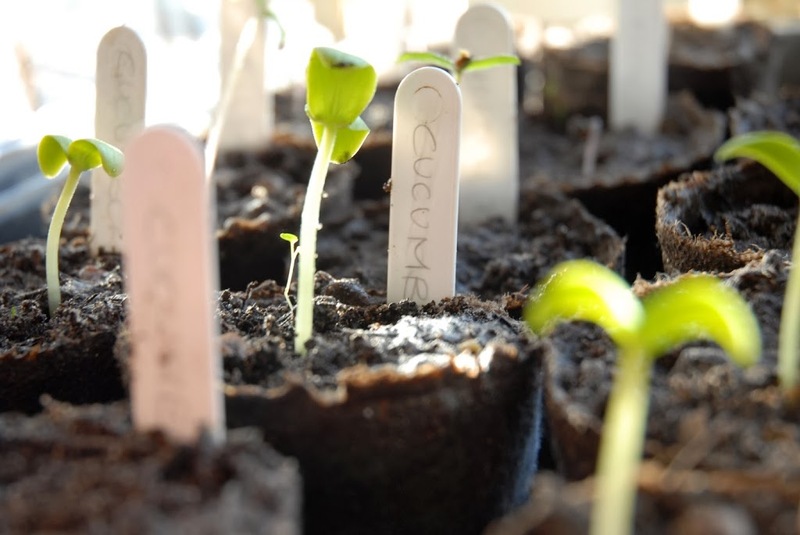 The seeds aren’t too small,they don’t take too long to germinate, they can be somewhat hardy (they produce plants here after very cold winters), and they aren’t picky about conditions. However, they do need a long growing season so you need to start them inside ahead of time here in the North, and the growing conditions will affect production and flavor of the tomato fruits. Aye, that is the rub. Want to start your own? I’ll give you a few good links here- but essentially you can get an old empty egg carton, fill the spaces with moistened seed starting soil, plant the tomato seeds in each cell, keep in a warm sunny window, keep slightly moist but not wet… and voila: tomato plants. There can be more to it than that, but that will work. I liked this page. Clear simple, and a few illustrations. Tomato seed starting Nice seed saving directions, too. Renee’s Garden, not only tells you how to plant tomato seeds, but offers some of the most tempting varieties for sale. A few other tips garnered are: Don’t over-water or over-feed,”water for 3-4 hours once a week rather than watering them for 30 minutes everyday. Over-watered fruits will often taste that way, watery. ~ Online Tomato Vine”. Tomatoes are picky about such things. A page of Tomato FAQs, including the answer to “cracking” prevention: even regular watering. That is important when it comes to blossom end rot, too. I don’t know that I’ve come across the next point I want to make, although maybe it is just a matter of emphasis and I overlooked it when reading tomato growing information. That is that your particular soil will make a difference in how your tomatoes taste. that is why you will have to experiment a little. Maybe do it the easy way and sample some neighbor’s tomatoes, then ask what varieties they like that best for the names of some to try.How you go about that is up to you, but it would be a boon in time and effort if you get some garden advice from people in your neighborhood. When I moved out here in corn and soybeanland I thought I would have the best tomatoes imaginable. Not so; my city garden produced superior ones- of course I grew them right out of the compost bin area in that cramped little garden…. and I’m sure that had a good effect on the flavor. I think the care we give in our smaller spaces probably explains some of that, too. The way I would debunk the normal advice on which varieties to grow is that heirlooms are always best- no they are not, and just because some garden or cooking expert likes a certain type does not mean you will. It’s OK, people have different tastes and sensibilities. Yours is good, theirs is good, -it’s all good. In the tomato tasting world, anyway. Get garden tips on the best types of tomato to grow from your neighbor and from your own garden efforts. Try out new varieties, but remember that VFN resistance is not over rated- it is a real asset in plant health and survival. One man’s gourmet is another man’s garbage. Taste test, and take notes on what you like. Pay attention to your tomato plants. Check them for pests (tomato hornworm is a veritable beast); water regularly but do not “over love” with moisture or feeding; if you stake, stake early; when your tomatoes come to harvest, be ready- it is a veritable shower of surfeit. And if you make tomato sauce, get one of those Victorio Model 250 Food Strainer/Sauce Makers. I’m serious. Get one. Does Everyday Design Matter? Of course it does. I mean we think that and might say it, but the way we live often says something else. Not that we don’t appreciate good design. Our appreciation sells books and magazines, it drives blogs…after all, some of the most popular have gorgeous photos all over the place and tell us about all sorts of things that will make our life more beautiful. And this post could be appropriate for any of the topics I write on since it addresses beauty, especially beauty in our everyday experience. Not just in gardening, but in life, although I chose to consider that garden part of giving thought to good design. We often settle for far less than we could, or should. The reasons why could range anywhere from whether we consider our own selves worth the effort to being too busy with other matters, to a bit of a laziness. But whatever the reason we could have better design and appreciate our own lives more if we “settled less”. In other words, if we decided that everyday good design mattered to us. In the garden I was specifically thinking about that old complaint about foundation plantings, and which could extend to overuse of “lawn”. Really, any part of the yard that suffers from unimaginative, uninspired spaces. Does that mean everything has to be professionally “designed”? Not what I’m talking about at all. Just some attention paid to using spaces in the best way for you and your family. That is a big part of “design”. I could give you a point list, but a better illustration comes from walking into a store that makes its business from this “everyday” design type of ideal. First example- When I walked into an IKEA store I was blown away by how simple clean lines and useful inventions create a well designed living space. It wasn’t dependent on expensive materials or intricate combinations. Instead thought was put into making good use of space, ease of maintenance, and people friendly usage. That same ethic creates a great landscape. Second example- Target household supplies and products. Tar-zhay for a reason. Good color combinations, fresh looks, clean lines, all for an affordable price. You don’t want to spend hours putting it together and taking care of it, and that can be how many people want their front gardens and back yards: they want them to work and not take lots of their time and effort. There is nothing wrong with that, but it can look great and work like that too… and that is what I mean by everyday design. Third example- Martha Stewart. I mean, she has built an entire business empire around the concept of incorporating good design into a simple and easy combination of color and look. I say simple and easy because it is edited to a workable number of colors and decisions that speak of a specific basic look. And from there the sky is the limit in terms of how detailed or how much effort you want to take in any direction: fixing your food or making your bed, or lounging out in yard under a tree. A little forethought in colors, plantings, how you want to use your space and it can all work. Where Do I Start My Design Efforts? Anywhere you want, but personally I would pick the front entrance and then the front yard as a whole after that. Think curb appeal, but not for everyone else, or to sell your house, but because you deserve something welcoming every time you look at your house after coming home from somewhere else. Your yard should welcome you. Then second, I would work on a personal space in your backyard. On facebook, a friend from “way back when” just bought a new house. You know what impressed me? She created an instant personal space by hanging outdoor curtains around a covered patio or lanai type area. It seemed like a perfect place to take time out and enjoy whatever was going to come next in her new garden…which was all in the planning stages. It is that sort of “everyday design” that I mean… making the space beautiful, even though it might not be the landscapers choice of a “to-do” list. I think that a to-do list gets accomplished by taking that sort of simple action, though. What steps can you take to get some good design in your front yard today? A well chosen pot for the entry? Fill it with soil and choose just one great plant to fill it if you don’t have time to design something more complicated, or go for it and put your effort into that and do some trim and cleanup in the rest of the entry. Take pictures of what makes a good design for you and draw your plans for this season…. make your yard more you, and little less every one else on the block. I guarantee that it will brighten everyone’s day, including your own. Were The Tomatoes Worth It in 2010? Sadly, to me, this year they were not worth the money and work invested; although I would always plant them. There is nothing as good as a well grown, homegrown tomato, and that is reason enough to try anew each year. It isn’t the tomato plants fault that I had a less than stellar year, again. It is partly the growing season, and partly my own darn laziness. I still have not mastered the art of the harvest. Leaving town (and thus not minding the garden) has been the late summer norm for me for several years. There just does not seem to be a good time to take a vacation from the garden. The late summer heat wave and the accompanying drought did a number on the tomato harvest, too. OK, those are this years excuses. Yet, if I am to see the children, grandchildren, and attend their important events… trips out of town are on the schedule for the growing season. But the real problem is how out of habit I’ve become with working in my kitchen. Instead, I’ve concentrated on tackling bad habits such as accumulating clutter, not building the good ones such as more time cooking from scratch at home. I feel a New Year’s resolution coming on. “Just Art” – that is an oddball thing to say, isn’t it? Art is one of the great pleasures of life. Creating and enjoying it… and what is more artful than a big bowl of beautiful tomatoes on the counter? It is ephemeral art, but that is how we should live…. life being full of artistic expression in daily things. In my opinion, anyway. This type of thinking is what gets in the way of the practical matter of slicing up tomatoes for our meals and making sauce from a good crop. But I do enjoy the beauty of the food garden! 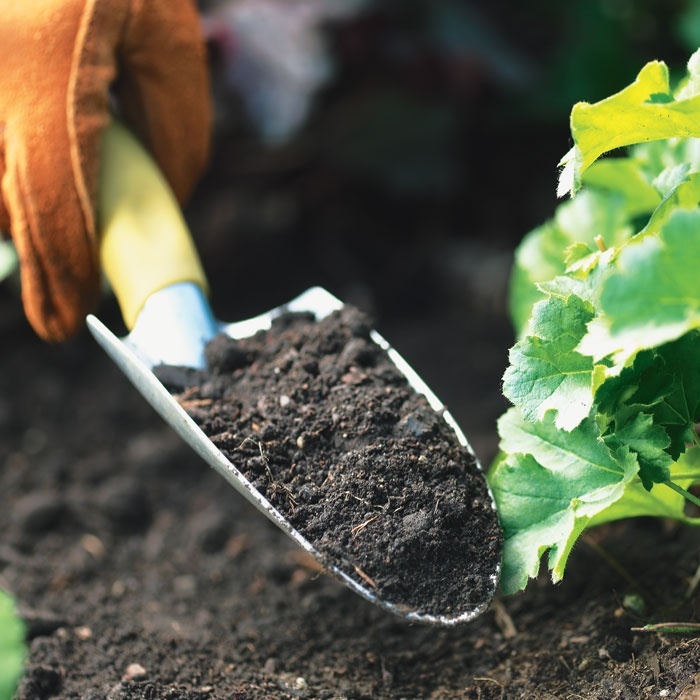 Fall is a great time to improve the garden soil. New Years Day, and its resolutions, is a long way off, so what can I do for next years good intentions, now? I have some new raised bed boxes this year, but I believe they could use some increased attention to building up the soil. Fall is a great time to put amendments into the soil. Now that frosts are coming, the vegetable garden will be cleared, tilled (if there are no heavy rains), and I will get the beds all ready for next years plots (in both meanings of the word). Save those leaves and create your own compost. Tomatoes love organic soils. Save seed from the heirloom types. Hybrids are not going to come true from seed, but that is how we get the heirlooms. Find a source of fertilizer and compost makings… used coffee grounds, manures,anything added to the ground now will mellow over the winter. Put away your tomato stakes, and tools so they can be used year after year. Invest in whatever equipment you need to make best use of your harvest. Collect and experiment with recipes that will motivate you to be a good steward of all the fruits of your labors. I’m listening to my own good advice this year…. and next.Really. How was your harvest? And do you have tips for me to encourage better use of the food garden fruits? I planted ‘Black Prince’ and ‘Black Krim’- did not like either. Too much gel for my tastes. I won’t go for those next year. I will look for ‘Pink Caspian’s again, or else try to raise my own seedlings come February. ‘Early Girl’ is on my short list of plants to buy at the nursery for 2011. © 2010 Ilona’s Garden Journal.All rights reserved.